Thanks for joining us on our brand new blog! 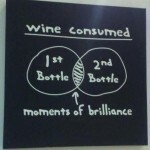 With this blog, we aim to bring entertaining, relevant and informative wine-themed ideas forth for all to consider. Whether you are a member of the wine trade or someone who simply enjoys wine, we hope that you will find something here to enjoy, alongside a tasty glass of wine, of course. We will endeavor to provide you with regular updates so check in often, or better yet you can subscribe to our blog so that you receive an automatic notification of every new post. Excited to be sharing our passion of wine with the people for whom it is made!